Hi, I'm Leila Leihuluonalani Fernandez Matthews, a professional dancer and choreographer with over 20 years of experience who moved to the Eastside from Oahu. I was uniki by Kumu Frank Keli'i Chang as a Kumu Hula in 2010. I learned traditional Hawaiian and Polynesian dances from my mother and operated a production company, Les'Lie Productions, in Hawaii with her. I've performed around the world in Japan (Tokyo Maihama Sheraton and Nagoya Castle Hotel), Okinawa (Sheraton Okinawa Hotel), Argentina (Sheraton Argentina Hotel), Taiwan (Ocean World), Hong Kong and many other places. 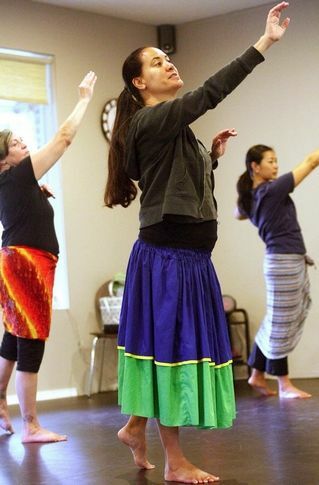 I noticed that there was a shortage of Hula and Tahitian dance classes offered around the Eastside; so, instead of teaching other dance forms like jazz or tap, I thought I'd bring a bit of my old home to my new home. In Hula dance, you're a group, you all have to dance exactly the same. So, you become a really tight group like Hula sisters. This close bond is especially relevant for the many people of Bellevue who weren't born in this area, or even this country. Hula, for many people, is often "that extra family that you might need." Thank you for visiting my website and letting me share my love of Hula with you!